Youth motivational speaker Jeff Yalden is stoked about his new book, BOOM! One Word to Instantly Inspire Action, Deliver Rewards, and Positively Affect Your Life Every Day! BOOM is a book about motivation and inspiration – a book Jeff has been working on since he went through a spinal cord fusion last year while also battling type 2 diabetes, losing 80 pounds along the way. He briefly retired from professional speaking, but has since come back stronger than ever, reestablishing his place among the best of the best. He recalls attending his nephew’s middle school basketball tournament recently in Wisconsin. His nephew was controlling the boards and putting up 20 points a game. The BOOM stuck – permanently enshrined in this captivating new book. But what is the BOOM? 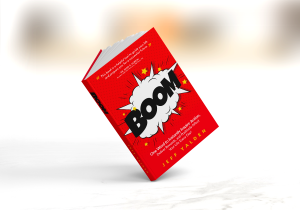 BOOM is a revolutionary mindset that is about to bring awesome back into your life. BOOM is a factor and an effect. The BOOM is the jet fuel you need to be able to turn challenges into new opportunities and to reward yourself after every accomplishment and every plan successfully executed. And in this book – Jeff will help you discover your BOOM! This brief read can change your life. BOOM launches on Amazon on May 28, but is being offered for pre-release for just 99 cents. That’s right – for less than a buck, you can download BOOM and start to make a change in your life! Simply head over to www.jeffyalden.com/BOOM and sign up to be notified when the pre-release drops. Also – Jeff really wants the BOOM to be significant in your life. He wants it to work for you, and invites you to be a part of his launch team by joining the BOOM Facebook group – www.facebook.com/groups/OneWordBoom. This is a place for you to share excitement – to share where the BOOM has been successfully implemented in your life. You can also see the BOOM moments and rewards that others are experiencing on this journey. Are you ready? If so, your BOOM awaits you.